Quick Note: This is my 1700th post! Space exploration is a booming industry these days. Between NASA, the ESA, Roscosmos, the CSA, and the federal space agencies of India and China, there’s just no shortage of exciting missions aimed at improving our understanding of our Solar System or the universe at large. In recent months, two such missions have been making the news; one of which (led by the ESA) is now underway, while the other (belonging to NASA) is fast-approaching. In the first instance, we have the ESA’s Rosetta spacecraft, which is currently on its way to rendezvous with the comet 67P/Churyumov-Gerasimenko at the edge of our Solar System. After awaking from a 957 day hibernation back in January, it has just conducted its first instruments observations. Included in these instruments are three NASA science packages, all of which have started sending science data back to Earth. 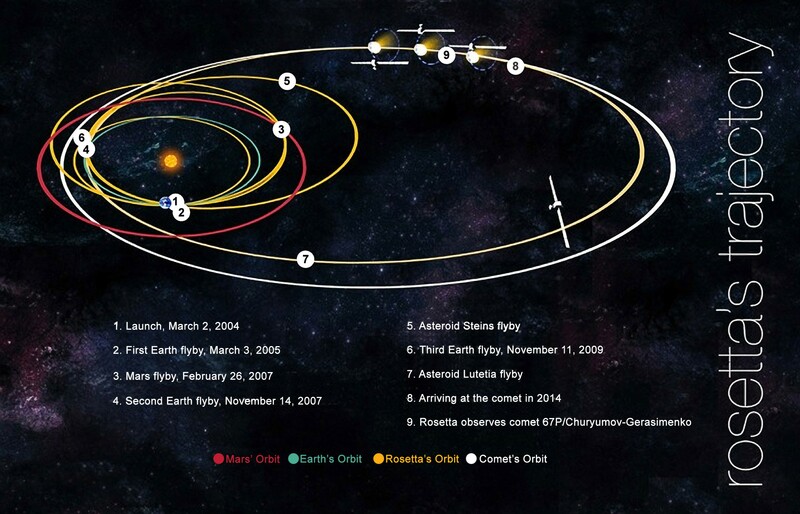 Since leaving Earth in March 2004, the Rosetta spacecraft has traveled more than 6 billion km (3.7 billion miles) in an attempt to be the first spacecraft to successfully rendezvous with a comet. It is presently nearing the main asteroid belt between Jupiter and Mars – some 500,000 km (300,000 miles) from its destination. And until August, it will executing a series of 10 orbit correction maneuvers to line it self up to meet with 67P, which will take place on August 6th. Rosetta will then continue to follow the comet around the Sun as it moves back out toward the orbit of Jupiter. 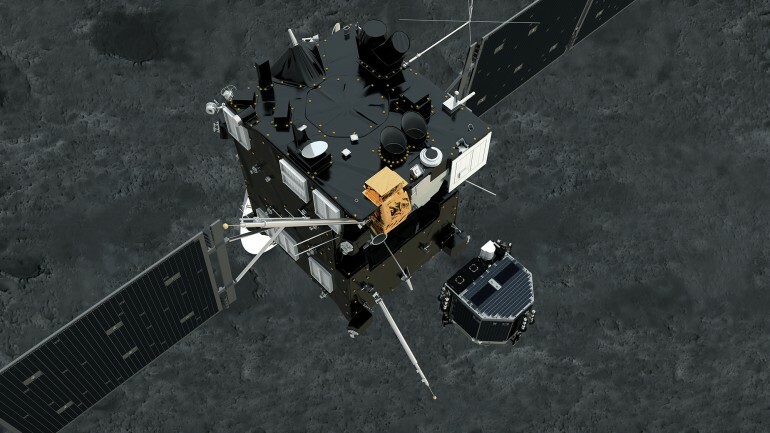 By November of 2014, Rosetta’s mission will then to launch its Philae space probe to the comet, which will provide the first analysis of a comet’s composition by drilling directly into the surface. This will provide scientists with the first-ever interior view of a comet, and provide them with a window in what the early Solar System looked like. The three NASA instruments include the MIRO, Alice, and IES. The MIRO (or Microwave Instrument for Rosetta Orbiter) comes in two parts – the microwave section and the spectrometer. The first is designed to measure the comet’s surface temperatures to provide information on the mechanisms that cause gas and dust to pull away from it and form the coma and tail. The other part, a spectrometer, will measure the gaseous coma for water, carbon monoxide, ammonia, and methanol. Alice (not an acronym, just a nickname) is a UV spectrometer designed to determine the gases present in the comet and gauge its history. It will also be used to measure the rate at which the comet releases water, CO and CO2, which will provide details of the composition of the comet’s nucleus. IES (or Ion and Electron Sensor) is one of five plasma analyzing instruments that make up the Rosetta Plasma Consortium (RPC) suite. This instrument will measure the charged particles as the comet draws nearer to the sun and the solar wind increases. Named in honor of the Rosetta Stone – the a basalt slab that helped linguists crack ancient Egyptian – Rosetta is expected to provide the most detailed information about what comets look like up close (as well as inside and out). Similarly, the lander, Philae, is named after the island in the Nile where the stone was discovered. Together, they will help scientists shed light on the early history of our Solar System by examining one of its oldest inhabitants. Next up, there’s the next-generation Orion spacecraft, which NASA plans to use to send astronauts to Mars (and beyond) in the not too distant future. And with its launch date (Dec. 4th, 2014) approaching fast, NASA scientists have set out what they hope to learn from its maiden launch. The test flight, dubbed EFT-1 is the first of three proving missions set to trial many of the in-flight systems essential to the success of any manned mission to Mars, or the outer Solar System. EFT-1 will take the form of an unmanned test flight, with the Orion spacecraft being controlled entirely by a flight control team from NASA’s Kennedy Space Center located in Florida. One vital component to be tested is the Launch Abort System (LAS), which in essence is a fail-safe required to protect astronauts should anything go wrong during the initial launch phase. Designed to encapsulate the crew module in the event of a failure on the launch pad, the LAS thrusters will fire and carry the Orion away from danger. Orion’s computer systems – which are 400 times faster than those used aboard the space shuttle and have the ability to process 480 million instructions per second- will also be tested throughout the test flight. However, they must also demonstrate the ability to survive the radiation and extreme cold of deep space followed by the fiery conditions of re-entry, specifically in the context of prolonged human exposure to this dangerous form of energy. Hence the Orion’s heat shield, a new design comprised of a 41mm (1.6-inch) thick slab of Avcoat ablator, the same material that protected the crew of Apollo-era missions. As re-entry is expected to exceed speeds of 32,187 km/h (20,000 mph), this shield must protect the crew from temperatures of around 2,204 ºC (4,000 ºF). 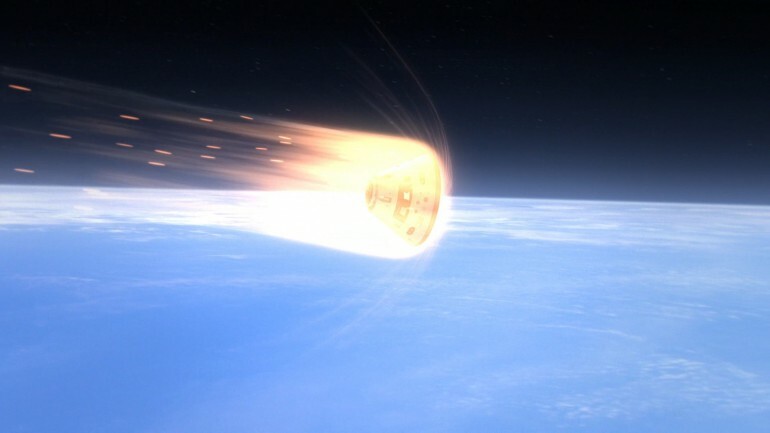 Upon contact with the atmosphere, the heat shield is designed to slowly degrade, drawing the intense heat of re-entry away from the crew module in the process. The final aspect of EFT-1 will be the observation of the parachute deployment system. Assuming the LAS has successfully jettisoned from the crew module following launch, the majority of Orion’s stopping power will be provided by the deploying of two drogue parachutes, followed shortly thereafter by three enormous primary parachutes, with the combined effect of slowing the spacecraft to 1/1000th of its initial re-entry speed. Previous testing of the parachute deployment system has proven that the Orion spacecraft could safely land under only one parachute. However, these tests could not simulate the extremes that the system will have to endure during EFT-1 prior to deployment. The Orion spacecraft, once recovered from the Pacific Ocean, is set to be used for further testing of the ascent abort system in 2018. Data collected from EFT-1 will be invaluable in informing future testing, moving towards a crewed Orion mission some time in 2021. The launch promises to be a historic occasion, representing a significant milestone on mankind’s journey to Mars. Orion, the product of more than 50 years of experience, will be the first human-rated spacecraft to be constructed in over 30 years. The Orion will be launch is expected to last four hours and 25 minute, during which time a Delta-2 Heavy rocket will bring it to an altitude of 5,794 km (3,600 miles) with the objective of creating intense re-entry pressures caused by a return from a deep space mission.